Well-known film and television actor, Mariano Peña, becomes the Lord of the Universe in the comedy that has triumphed in New York. 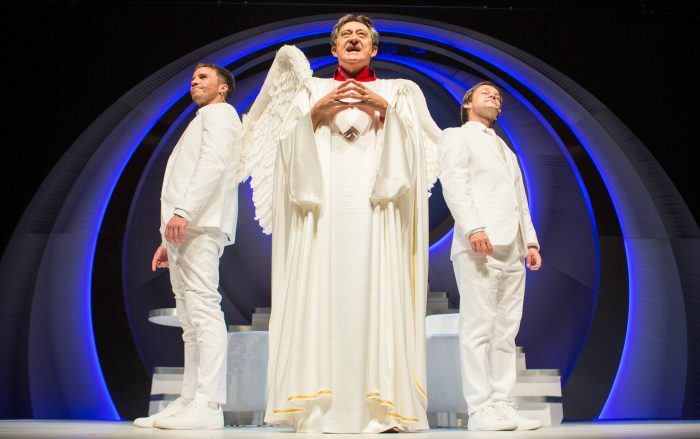 Obra De Dios, or Work of God, written by David Javerbaum and directed by Tamzin Townsend, a co-production of Txalo Producciones and Pentación Espectáculos. Bernabé Fernández and Chema Rodríguez-Calderón complete the cast of this critically acclaimed production. The Lord of the Universe, creator of Heaven and Earth, visits us in the theatre to rewrite his ten commandments. At last the answers arrive to all those questions that we ask ourselves from the beginning of our era. Why did God create Adam? Was Eve really a sinner? How many animals did Noah put in the ark? The authentic story never told of the protagonists of the Bible: Jesus, Abraham, Moses and Steve Jobs. Everything you always wanted to know answered by the king of space and time and his faithful archangels. We only assure you one thing … you will not stop laughing.